the EVACO Toilet Squatting Platform! The price of the current (still available) model of EVACO toilet squatting platform is Singapore Dollars S$300 (about US$210 at current exchange rates), plus handling and shipping charges. 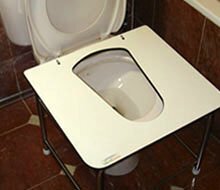 It will fit all standard sitting toilets up to 41 cm or 16.2 inches in height (from floor to top of toilet bowl, with seat cover lifted up), and 42 cm or 16.5 inches wide (the toilet bowl). There are 7 zones, each with different delivery times, fees and hence total price, as shown below. Before you place your order, please confirm the country/zone you are in, and then click on the Buy Button. Orders are shipped on Wednesdays and Saturdays. Once again, thanks for your interest and/or order. If there is anything else that I can do for you, please write to me through this page. Whatever your decision is, ie: to buy or not to buy the Evaco toilet squatting platform, do your best to squat when clearing your bowels. The human and financial costs of (sitting) toilet-related health problems are simply too great for you to ignore, as revealed in this article. I look forward to be of service. Want to know why sitting toilets have become so widespread in the world today? And whether it is true that squatting is better than sitting? You can find the answers to these and other questions by reading Nature Knows Best.